Stellar battery life and strong fitness-tracking capabilities make this the perfect smartwatch for Android users. 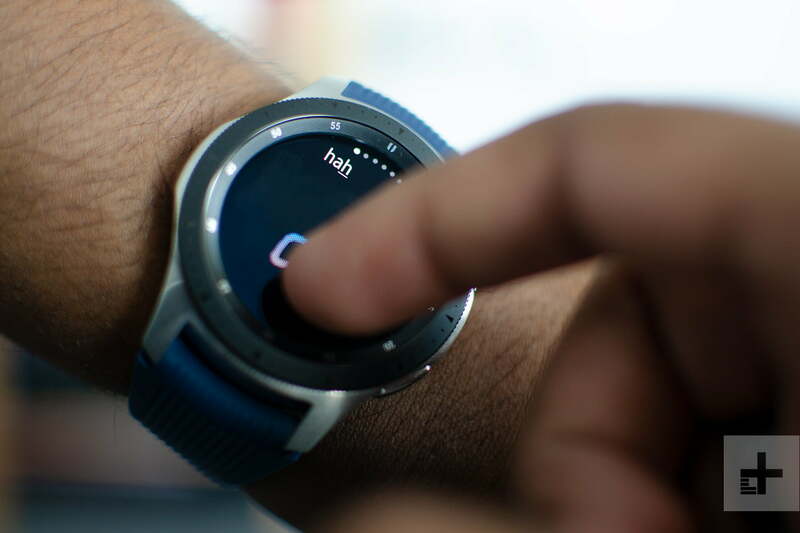 Wearing Samsung’s new Galaxy Watch smartwatch, we’ve hit four days on a single charge – and could have stretched another day or two if we used it more conservatively. 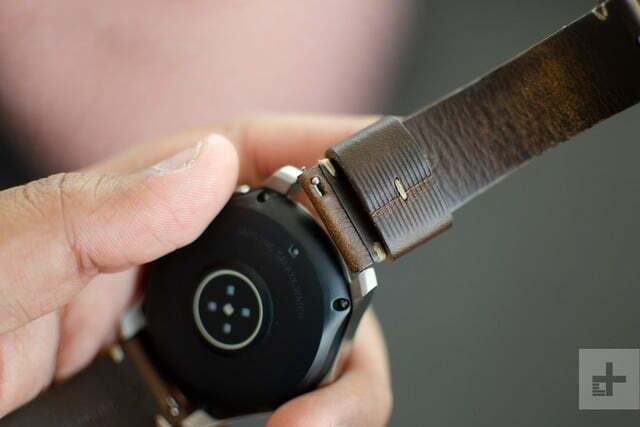 If you’re tired of smartwatches dying before you get home after work, this is your relief. 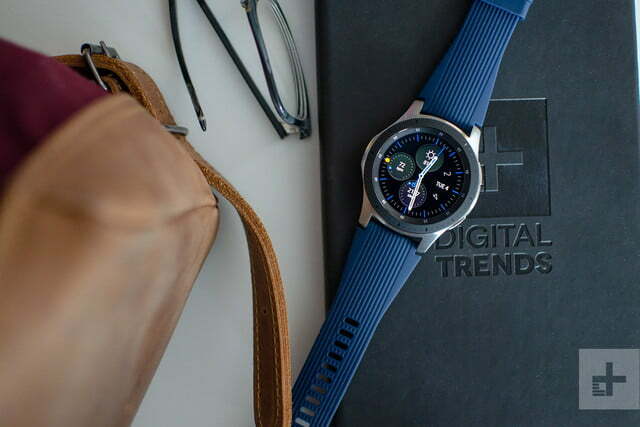 The Galaxy Watch has almost everything and anything you’d want, while also maintaining the best way to navigate a smartwatch operating system. It’s not without flaws: Bixby leaves much to be desired, Samsung Pay isn’t as useful as before, and the watch often presents you with a lot of data, but doesn’t tell you what to do with it. 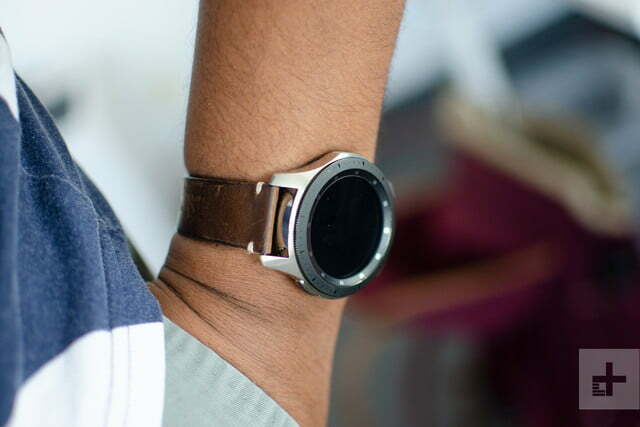 But the Galaxy Watch’s positives outweigh its negatives, and it’s easily the best smartwatch for Android users. Let’s dive in. 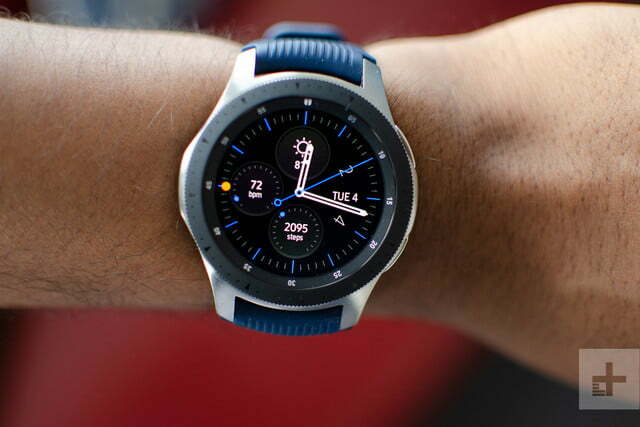 The new smartwatch succeeds the Gear Sport and the Gear S3, and the rumored name for it was Gear S4 until Samsung announced the branding change to Galaxy Watch. The companion app also changed names from Samsung Gear to Galaxy Wearable. There’s no revolutionary feature here that denotes the need for the branding change from Gear to Galaxy, and we expect it’s just Samsung’s efforts to bring more of its products into the popular Galaxy umbrella. As such, not much has changed with the design over the S3. Samsung’s still following a traditional timepiece design with a round watch face, while opting for sporty looks. We prefer this round design over Apple’s square watch, as it helps make the watch blend in with outfits a little more, and not look too techie. The lugs slope down, minimizing the gap between the watch and the wrist, and two textured, elongated buttons sit on the right edge. We do think Samsung could ease up on the clutter, though. It’s attractive, but between all the numbers and markers on the bezels, there’s a lot going on. 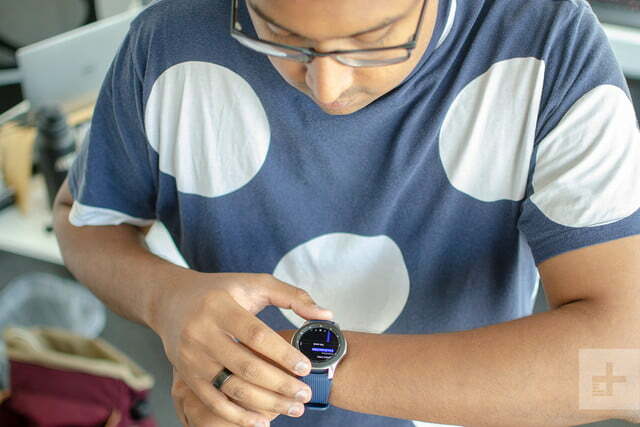 Minimalists may prefer the Apple Watch, the Skagen Falster 2, or even Samsung’s own Gear Sport. It allows you to see the screen fully as you navigate, instead of having your finger blocking the view. This busyness can be mitigated by selecting a simple watch face, which is one area where the Galaxy Watch shines over the Apple Watch — there are plenty of great-looking watch faces to choose from if you’re not interested in the pre-installed ones. The highlight design feature, however, remains the rotating bezel. The edge around the screen rotates and makes a clicky sound similar to a combination padlock. It’s what you use to navigate the menus and apps, and it’s arguably the best way to interact with a watch OS. It allows you to see the screen fully as you navigate, instead of having your finger blocking the view. It’s still touch screen capable, as you’ll need to tap on the screen for many functions. There are two size options: A 46mm in silver, and a 42mm in black, and rose gold. 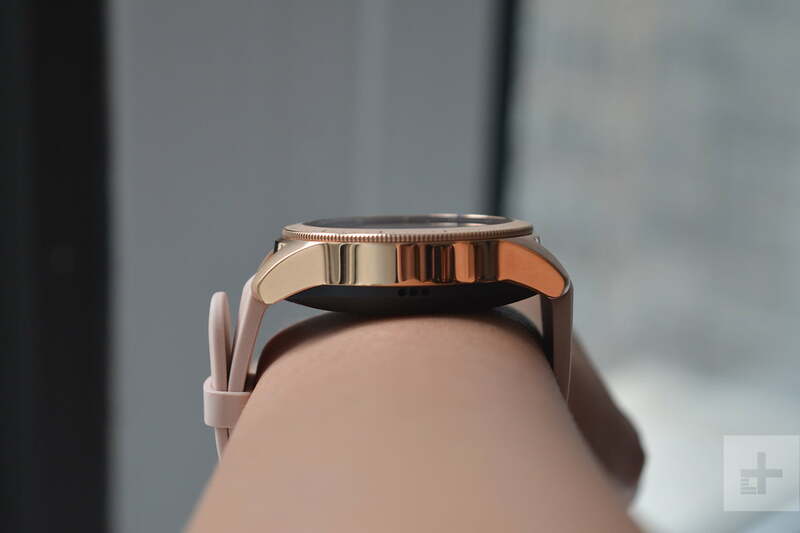 The 46mm uses 22mm straps, while the smaller watch allows 20mm straps. The standard silicone bands are comfortable to wear and don’t pick up dust and lint easily, but you can quickly swap out bands for whatever you fancy. 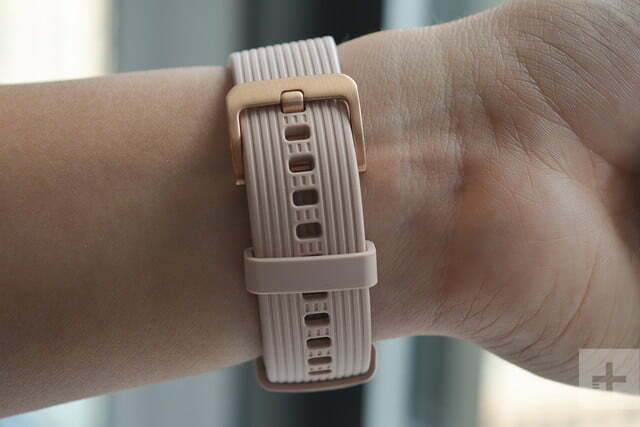 We swapped our 46mm silicone band out for a leather strap, and it hardly took more than 30 seconds. Both size models are comfortable to wear, though we feel as though the 42mm model is still quite large and heavy for smaller wrists. 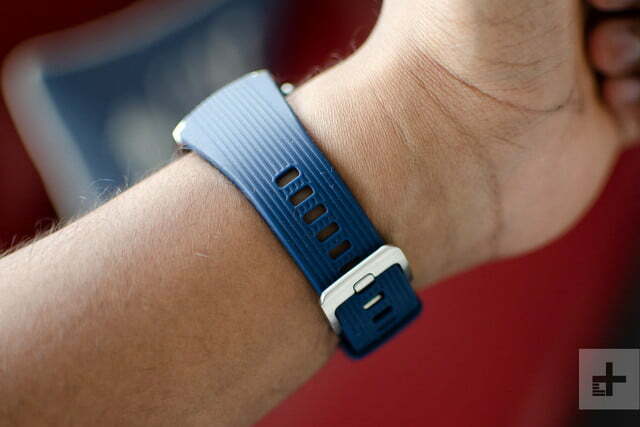 We do have a complaint about the wristband for the smaller model: It’s a little too big as the watch wriggled around our wrist even after fastening it to the last notch on the strap. This can be easily solved by swapping to another third-party band. If you’re worried about this watch being too heavy or bulky on your wrist, we recommend heading to a retailer or carrier store to see if you can try the watch on before you purchase it. The 46mm model has a 1.3-inch screen and the smaller watch packs a 1.2-inch screen, both with the same 360 x 360 resolution. The Super AMOLED screen is excellent. It gets plenty bright to see outdoors — which is crucial for a watch — colors pop off the screen, and blacks are inky deep. It’s all protected by Corning’s Gorilla DX+ glass, and while we have yet to drop the watch, we’ve dinged it on walls and rails and we haven’t seen a single scratch. 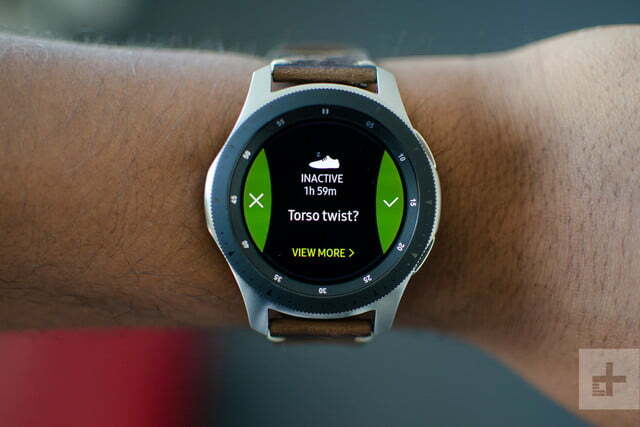 Samsung said it made a custom 1.5GHz processor to power the Galaxy Watch, so it could improve the watch’s battery life. There’s 768MB of RAM, and the watch is running version 4.0 of Samsung’s Tizen wearable OS. We’ve hardly encountered problems with performance on this watch. Sure, if you rotate the bezel all the way to the right incredibly quickly, you’ll see some stuttering, but for the most part, the interface is fluid and speedy. We did encounter two bugs: Some apps occasionally freeze, requiring the need to go back and tap on the app again; and the raise-to-wake function doesn’t always work, which is frustrating when you simply want to check the time without tapping on the watch. Samsung said the latter issue will be resolved in an upcoming update. You can’t pay anywhere cards are accepted anymore. Now you can only use it at cash registers that have NFC terminals — or places that support Apple Pay and Google Pay. Otherwise, Tizen is quite enjoyable to use; it’s simple and easy to navigate. The left side of the watch face is where notifications live — the watch only shows notifications from 20 random apps by default. You can swipe up to delete them from your phone, or tap on them to further interact. Scribbling away short responses is our go-to method of responding, though using voice does the trick too. On the right side of the watch face are widgets, and you can press and hold to either delete them or change up the order to your liking. Swipe down from the main watch face to access settings. Tap and hold the top button to access Samsung Pay. Samsung has sadly removed Magnetic Secure Transmission (MST) technology from the watch, which means you can’t pay anywhere cards are accepted anymore. Now you can only use it at cash registers that have NFC terminals — or places that support Apple Pay and Google Pay. Tap the bottom button to access all your apps, or double tap it to ask Bixby a question (you can also just say “Hi Bixby). Bixby replaces S Voice, and it’s more limited than Bixby on Galaxy phones. For example, it won’t be able to tell you who is the President of the U.S., or how many inches are in a foot, but it can give you the weather, your agenda, or you can use it to start texts with your contacts. We never found the need to use it, as it is often much faster to scroll to the appropriate widget. We do like the My Day feature Samsung added to the Galaxy Watch: When you wake up, there’s a handy notification allowing you to see an outline of your day, including calendar events, reminders, and more. There’s also improved Spotify integration, making it easier to download, play, and control your playlists — a serious advantage over the Apple Watch (though maybe not for long). If you don’t have the streaming music service, you can transfer up to 4GB of songs via the Galaxy Wearable app. So how is it handling notifications on the watch? We were surprised at how much we used the watch to see, dismiss, and respond to notifications. We were able to respond to emails, messages from various messaging apps, and answer calls — with great call quality coming through the speaker and for the person at the end of the line. While third-party app support is lacking — we would have liked to see Google Maps for turn-by-turn navigation, or third-party to-do and reminder apps — Samsung does a solid job of offering most of what you’d want in the box. A robust collection of fitness apps, including Endomondo, MapMyRun, and UA Record, all work with the Galaxy Watch. Using the Galaxy Watch with an iPhone is a little more limiting. Smartphone notifications will come through — including text messages, phone calls, and social media alerts — but you will only be able to read and dismiss them; there’s no other interactivity. If you accept a call, it will automatically answer on your smartphone instead of using the watch’s speaker. Samsung Pay won’t work as well, and you won’t be able to access any paid apps from the Galaxy Apps store. One thing we’re not too fond of is the number of plugins and apps you need to install to use the Galaxy Watch — especially on a non-Samsung phone. There’s the Samsung Pay plugin, the Samsung Accessory Service, and the Samsung Health app if you want to get the most out of the watch. It’s not as streamlined as setting up an Apple Watch or Wear OS smartwatch. 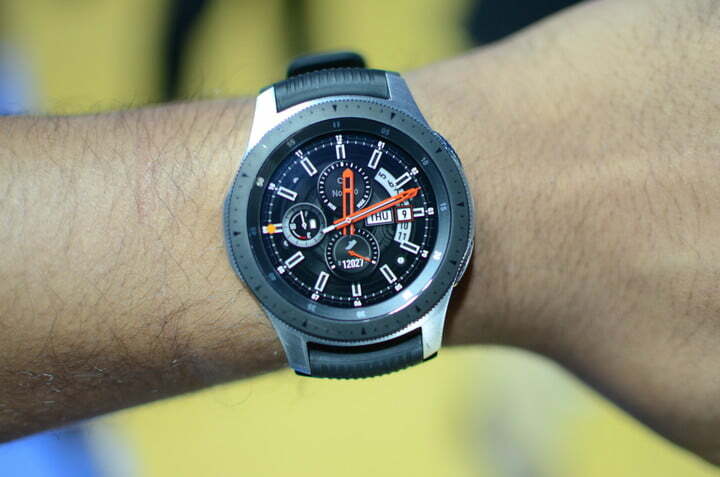 One of the main reasons you may buy this watch is to track your physical activity, and the Galaxy Watch excels. There are now up to 39 workouts you can track in total, 21 of which are indoor exercises, and the watch can automatically detect six workouts such as walking, running, and cycling. We love the watch’s ability to automatically detect when you have started walking at a strong pace (after 10 minutes), and it starts a counter to encourage you to keep going. There are also plenty of “inactive” alerts, which reminds us of our laziness, but it’s a good wake up call to take a stroll to stretch our legs. We tracked a running and walking session, and the results are quite similar to the Apple Watch we wore on the other hand, with the Samsung watch delivering a slightly higher step count than the Apple Watch. 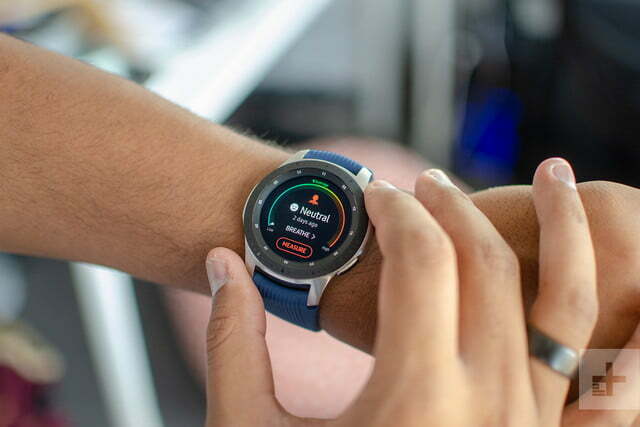 No matter what type of activity you’re doing — whether it’s hiking, swimming, cycling, or weight-lifting, tracking this data is what the Galaxy Watch does best, and you’ll be satisfied with its results. We’re also happy with the amount of data Samsung provides on the watch itself, so you don’t always need to check the Samsung Health app on your phone. The built-in heart rate sensor is also accurate, matching our Apple Watch results (off by 2 beats or so), and also similar to our manual results. You can check your heart rate at any time, but the watch also takes your heart rate every 10 minutes, and you can see this historical data in the Samsung Health app (or see day averages on the watch). It’s unfortunate there’s no way to get an alert when the watch detects an elevated heart rate, as it seems to help save lives for people wearing the Apple Watch. 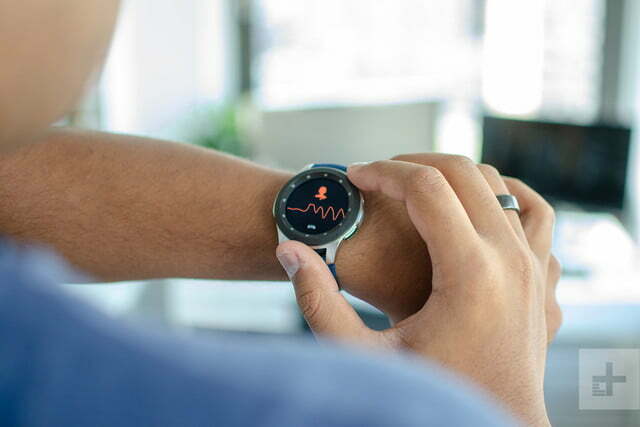 We’re happy with the amount of data Samsung provides on the watch itself, so you don’t always need to check the Samsung Health app on your phone. There is a built-in GPS you can use to track runs (through the Samsung Health app), but unfortunately iPhone users won’t be able to take advantage of this. You’ll have to stay tethered to your phone if you want to map your runs. 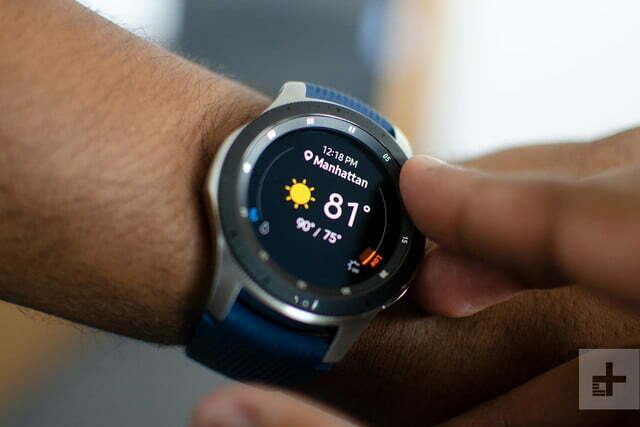 The Galaxy Watch can also track the flights of stairs you climb, but this data has been relatively hit-and-miss. It’s accurate sometimes, but on other occasions it grossly overestimates the number of flights climbed — potentially confusing it with an elevator. Like the Apple Watch and Fitbit trackers, the Samsung Health app lets you challenge friends to hit a certain step count. It’s a fun feature that stirs friendly competition, though we wish group challenges were available, as you’re restricted to one-to-one challenges. The Galaxy Watch can track your sleep and sleep quality, if you’re inclined to wear the watch to bed. We’ve seen it only lose about 4 percent of battery life overnight, and the Do Not Disturb mode will keep the watch from vibrating or lighting up during the night. It’s not uncomfortable to wear to sleep, but we never forgot it was there. Fit is subjective, and some may find it too heavy or bulky to wear to bed. The sleep tracking data is surprisingly accurate, highlighting actual sleep time, light sleep, restlessness, and time spent motionless. You can also rate your sleep for better historical data. While you can see your sleep history accumulate over time, one thing Samsung isn’t good at is describing what these numbers mean — there’s not even an option to compare results with average sleep data based on age. Sure, my sleep is 91 percent efficient, but what does that mean? Shouldn’t the Samsung Health app at least recommend more sleep if it recognizes my numbers are too low? These are areas where Samsung has room to grow. The same can be said for the new stress-tracking feature. It does feel therapeutic to take a breather and check stress level, but we have yet to receive any alerts encouraging us to take deep breaths when stress levels are high. Other than reviewing historical data, there’s no explanation or advice for what else we can do to manage stress levels. While it does a lot, the Samsung Health app is a bit of a cluttered mess. There’s far too much going on, making it tough to quickly navigate, and it’s made even worse by unnecessary features such as a Flipboard integration. The 46mm watch has a 472mAh battery capacity, and we’ve managed to make it last four days, including a few workouts and routine interaction with notifications. But we did turn off the always-on screen, and use Bluetooth over Wi-Fi. With the always-on screen, we managed to get about two full days of juice. The 270mAh battery on the 42mm model lasted us about two and a half days. It only hit 79 percent by the end of the first day. By the early afternoon on day two, there was 53 percent left and by day three we saw it deplete to 18 percent at around 12:30 p.m. This model was connected to an iPhone, however, so we didn’t use as many of the features as the 46mm connected to an Android phone. Those who use an Android device with this model might see around two days of battery life. We’re more than satisfied with battery life, so much so that we don’t even think about needing to charge the watch daily anymore. The included wireless charger charges the watch up to full in a little more than an hour. We predominantly used the Samsung Wireless Charger Duo to fill it up, which also supports fast charging. The Galaxy Watch costs $330 for the 42mm model, and the 46mm version will set you back $350. Both are available now from Amazon, Best Buy, and Samsung’s website. 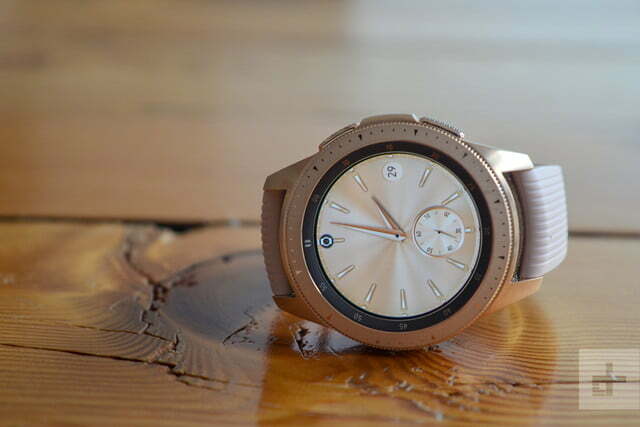 An LTE model is also available from T-Mobile at the moment, costing $375 and $400, with other carriers including AT&T, Verizon, and Sprint set to carry the watch later this year. Samsung offers a standard one-year limited warranty that covers the watch from manufacturing defects. Samsung’s Galaxy Watch is an excellent all-around smartwatch for Android users with strong battery life. For iOS users, yes — the Apple Watch. It’s much better integrated with the iPhone and it will give you a much wider range of features. That being said, Apple is expected to unveil a new Apple Watch at its September 12 event, so we recommend holding off purchasing one. It’s also worth waiting for Qualcomm’s September 10 event, where the company is expected to announce a new wearable processor that will benefit Google’s Wear OS. Expect to see Wear OS watches soon with much-improved battery life and fitness-tracking features. Take a look at the Fitbit Versa as another alternative. The Versa can deliver many of your notifications from your phone to the watch, though you won’t be able to interact with most of them. 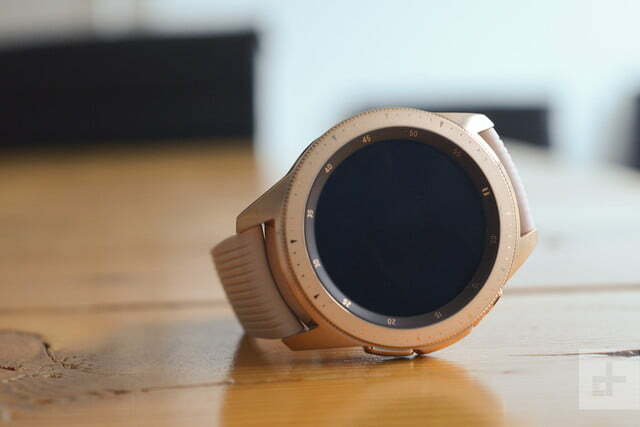 It has great fitness-tracking capabilities, four-day battery life, it looks good, and it costs less than $200. You can check out our guide to the best fitness trackers for more. We expect this watch to last you a little more than two years, but perhaps not much more. It’s the battery that will start to degrade, and you’ll likely want to replace it for that reason after the two-year mark. The watch is water resistant up to 5 ATM, which means you can take this watch underwater up to 130 feet, and Samsung said its durability has been tested to MIL-STD-810G standards. Yes. 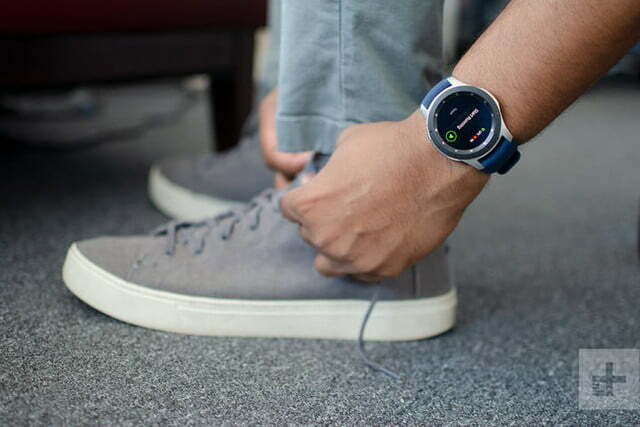 The Galaxy Watch is an excellent smartwatch that looks good, tracks your activity incredibly well, as well as heart rate. It’s fun using the rotating bezel, and we love interacting with our notifications on the watch.